Catch a glimpse of Mount Aconcagua, the highest peak in the Americas. See the sights of Mendoza, a city of wide, leafy avenues, atmospheric plazas and cosmopolitan cafes. 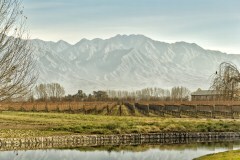 Stay a night at a vineyard in the heart of the premier wine-growing region of Argentina. Add another day to further enjoy your winery experience. Mendoza is a well known adventure destination so if you're after something more active then we can offer a range of options including rafting, trekking, horse riding or cycling. On arrival in Mendoza, you will be met and transferred to your centrally located hotel where you will spend the next two nights. Early this morning you will be picked up from your downtown hotel for a half day city tour. The tour will inform you of the history and the culture of a city founded by the Spaniards more than four centuries ago. You’ll make a visit to Independence Square, the main avenues and the civic area, the aquarium, general San Martin Park and Mount de la Gloria where you’ll see a panoramic view of the city. This evening is at your leisure and we recommend enjoying pizza at one of the many restaurants along with a good bottle of malbec, the area’s speciality. Early departure from Mendoza City to the west to enter the Andes mountain road toward the border of Chile. 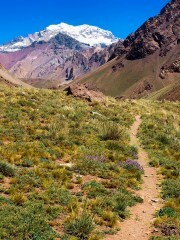 Along the way, we’ll admire, among other attractions, the superb view of Mount Aconcagua, the highest peak in the Americas . We’ll also visit Chacras de Coria, Potrerillos Valley, Uspallata Valley, Penitentes Ski Resort, the striking Inca’s Bridge (a natural formation of rock and sulphur, which gives it its golden colour), and the border village of Las Cuevas. Weather conditions permitting, we’ll drive up to 4,200 metres above sea level where the statue of Christ the Redeemer is located on the border with Chile. We’ll return to the hotel in the late afternoon. Today you will be transferred to the Lares de Chacra wine lodge where you can spend the day as you wish. Enjoy some time in the stunning swimming pool of the property, walk to one of many wine cellars located within a short proximity of the Lares de Chacra such as Pulmari or Clos de Chacras or visit the Chacra de Coria principal square. Day at leisure before we transfer you to the airport for your outgoing flight. The hotel also arranges cooking classes where you can learn to prepare and cook such local specialities like empanadas. Accommodation in single or twin rooms with private facilities, hotel taxes, small group tours with English speaking guides, private transfers, meals as specified. Airfares, airport entrance/departure taxes, gratuities, travel insurance, any items not mentioned as included. Please note, this tour only departs Tuesdays, Thursdays & Saturdays at 8.30am. One night pre-tour accommodation is recommended. Upgrade to private basis for daily departures at any time. Contact us for more details. Hotel rates are based on twin share in lead in rooms. Other room types and hotels are available. Rates are subject to change and different rates may apply during holiday seasons and special events. Single supplement will be applied if travelling alone or if you wish to have a room to yourself.